YouTube is a video-sharing website. The site allows users to upload, view, and share videos, and it makes use of Adobe Flash Video and HTML5 technology to display a wide variety of user-generated and corporate media video. You can find the available content includes video clips, TV clips, music videos, and other content such as video blogging, short original videos, and educational videos. Unregistered users can watch videos, and registered users can upload videos to their channels. Lots of people benefit more from YouTube to find the helpful clips or share their wonderful videos. iTunes Store provides a lot of sources. If you have some iTunes videos purchased or rented from iTunes Store to share, it will be hot and eager to watch and download. You will give benefits to more people. What are the best video file formats for YouTube uploading? According to YouTube help center, it is able to support 8 video formats for uploading: MOV, MP4 (MPEG4), AVI, WMV, FLV, 3GP, MPEGPS and WebM. However, iTunes videos are M4V format originally created by Apple with Fairplay DRM protection. Because of DRM, you can't upload iTunes videos to YouTube. If you want to put iTunes videos on YouTube, you need to remove the DRM at first. Now you need a professional iTunes Movie Converter which can help you to change your incompatible iTunes M4V files to compatible ones with YouTube. Here M4V Converter Plus is highly recommended for you. With it, you can convert your iTunes videos without DRM protection to YouTube video like MP4 or MOV with perfectly output quality. So when you upload iTunes videos to YouTube, the others can view and download the iTunes videos successfully. Step 1. 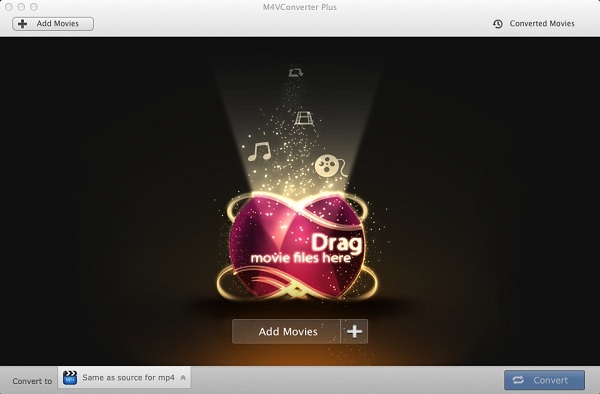 Download M4V Converter Plus, install and run it on your Mac. 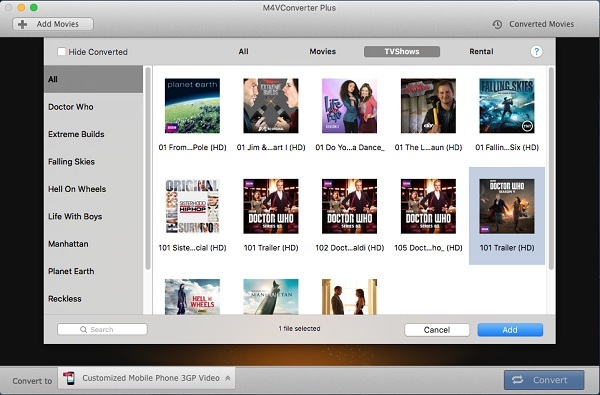 M4V Converter Plus supports converting several iTunes videos, including iTunes purchased movies, Rentals, TV Shows and music videos. Step 3. Choose the YouTube supported video format. Click Convert to drop-down list and choose YouTube H264 HD Video as the output format. This program provides you several presets for sharing the iTunes videos on YouTube. You can also convert M4V to MP4, MOV, AVI, FLV, etc. Click Convert button to open the converting box and start converting. After converting is done, you can find the output in the Converted Movies list. With M4V Converter Plus, you can easily get the output with YouTube video format without DRM protection. Then you can upload iTunes videos to YouTube freely. Followed by your fans, you may enjoy becoming one of them and share your more iTunes videos.